If you’ve been searching for the best GACE test prep guides, I know that you’ve noticed something very peculiar. There are a lot of 400 page textbook-like GACE practice test questions on Amazon.com and Barnes and Noble. However, they do NOT contain any type of direct route to pass your Georgia Assessments for the Certification of Educators. In fact, if you try using those types of books to prepare, you can feel very overwhelmed. With so many brain crushing pages of information to memorize and your testing date quickly getting closer and closer, it’s demoralizing. For GACE prep, you could pick up a practice exam or preparation materials meant for another teacher certification examination. However, that’s not exactly the smartest thing to do, is it? After all, each standardized test for state teacher certification has its own framework and test design that need to be studied for. Not sure what I mean here? Take a moment to think about the situation you’re in. You’re gearing up to take one of the most important exams of your life created by the Georgia Professional Standards Commission (PSC) and National Evaluation Systems, Inc. (NES®). Whether you need to pass the Math, Special Education, Professional Pedagogy, School Counseling, English, Science, Social Science, Middle Grades, Early Education any other Georgia test you may have the same problem. Most test practice guides are your typical cookie-cutter study manuals from a big name publishers. You’ve heard from other test takers those preparation guides are mediocre at best. Trying to find free GACE exam prep online yields even worse results. Feel that terror that’s growing in the pit of your stomach? That sinking sensation of dread and fear? That, my friend, is what’s known as test practice intimidation. And if you’re not careful, it can get rob you of your bright future as a teacher. Not necessarily – because I’m going to show you how to overcome intimidating dilemma. First, stop picturing the makers of your Georgia teacher certification test as doctors and highly educated professors who teach at Harvard and Yale as a hobby. In fact, you’d be surprised at who the makers of the exam really are: freelance writers who’ve had the help of graduate students and certified Georgia teachers. In other words, they’re people just like you and me. 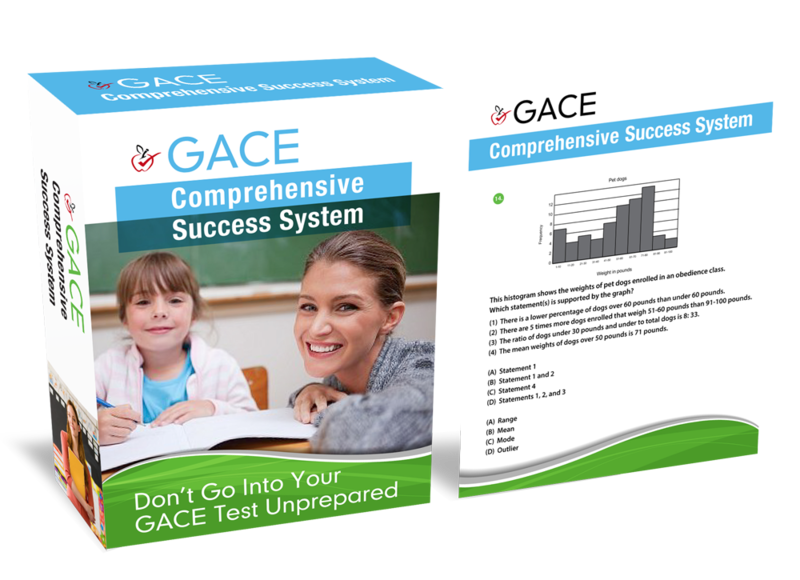 There may be an apparent lack of GACE test prep study guides out there – but that’s only if you’re looking for big-name study guide brands. Instead of searching for well-known names, look for test practice questions written by smaller independent preparation companies. The information contained in these lesser known sample questions and study resources are much closer to what you’ll see on your quickly approaching exam date. You can be guaranteed one thing about this teacher assessment’s exam questions: it’ll always follow an formula. It’s a standardized test. GACE test designs and frameworks have a structure, format and content that is surprisingly similar across numerous test dates. Once you understand this formula, you can master the Georgia teacher certification exam. Then go to: FREE GACE Test Study Guide And Preparation Resources Online right now.